Kate Davidson – Yoga instructor and amateur detective. A woman who owns a yoga studio is pulled into a murder investigation when a homeless man is murdered. I found this to be a very entertaining mystery. The characters were interesting, the plot was just intricate enough to keep the pace going, and for a debut mystery I thought the author did a really good job. There was the twists and turns in the main plot, as well as a secondary plot involving Kate’s friend and her friends husband. This is an author whose next work I would be glad to look at. If this debut is any indication, I think she’ll do well in the mystery field. I would rate it about PG-13 due to language, situations, etc. Overall though, I found the story enjoyable and for a lighthearted, cozy style mystery, and a good weekend read, pick up a copy of Murder Strikes a Pose and be sure to drop by and let us know what you thought. Tracy Weber is a certified yoga teacher and the founder of Whole Life Yoga, an award-winning yoga studio in Seattle, where she currently lives with her husband, Marc, and German shepherd, Tasha. She loves sharing her passion for yoga and animals in any form possible. Tracy is a member of the Pacific Northwest Writers Association, Dog Writers Association of America, and Sisters in Crime. When she’s not writing, she spends her time teaching yoga, walking Tasha, and sipping Blackthorn cider at her favorite ale house. Murder Strikes a Pose is her debut novel. Rhodes Review: When did you first realize you wanted to be a writer? Tracy Weber: The idea came to me on a rainy evening about three years ago, while in the middle of a brutal workout at my favorite health club. I was pedaling away, reading a Susan Conant novel to distract myself from the evil exercise bike, when a quote from Black Ribbon about crazy dog people made me burst out loud laughing. I knew I’d found my author soul mate. Someone who truly got me. I went home, looked her up on the web, and stumbled across a site about cozy mysteries. As I read about hundreds of other wonderful cozy series, I began to wonder: What would happen if a yoga teacher with a crazy dog like mine got mixed up in murder? Kate Davidson and Bella popped into my head a few days later. The rest is history. Rhodes Review: What is your work schedule like when you’re writing? Tracy Weber: I’m lucky. I own my own business, so I’m able to work any eighteen hours a day I want. Seriously, sometimes it feels that way. My writing ebbs and flows based on the other competing priorities of my life. Sometimes several weeks will go by without my having time to write a word. Other times I write nonstop. I’m most creative late at night, which drives my husband crazy. Most weeks I probably dedicate thirty hours or more to fiction writing. Blogs and other writing are on top of that. Rhodes Review: As a child, what did you want to do when you grew up? Tracy Weber: It varied over time. First, I wanted to be a horse rancher. Then a veterinarian. By the time I left for college, I was going to be a doctor. I ended up with a Chemical Engineering degree. Twenty years later, I owned a yoga studio. Now I write mysteries. No wonder my husband says I have career ADD! Rhodes Review: Which of your characters is most/least like you, and in what way(s)? Tracy Weber: On the surface, Kate and I are a lot alike. We both own yoga studios in Seattle, are vertically challenged, have body image issues, and are head-over-heals in love with a ginormous German shepherd. But personality-wise, I’m closer to Rene. A plotter, a trickster, a conniver, but completely loyal to my friends. At least that’s what I tell myself. Rhodes Review: Do you have any suggestions to help me become a better writer? If so, what are they? Tracy Weber: Write what you love. You may not become famous. You may never even get published. But you’ll spend your days immersed in your passions. What could be better than that? Rhodes Review: What inspired you to write Murder Strikes a Pose? My dog, Tasha, has some of the same issues as Bella. She’s huge, not always perfectly-well behaved, and she has a variety of expensive health conditions, yet I adore her to a fault. Living with Tasha has changed my life, in every way for the better. At the same time, she gets me into some pretty funny situations sometimes. My yoga students have been putting up with my “Tasha stories” for years now, so writing them down seemed like a no-brainer. A human inspired the plot of Murder Strikes a Pose, however. A homeless lady used to hang out near the entrance to my neighborhood grocery store, and she always had a large Rottweiler mix in a crate next to her. Over time, I got to know them both, and I asked her about the crate. She told me that the Rottweiler would sometimes lunge at other dogs that walked by on the sidewalk. The crate—which she stored behind the building at night—allowed her to keep the dog with her, in spite of its reactivity. The lady (I’m so sorry I never learned her name!) adored that dog and went to great lengths to take care of it, in spite of her own financial issues and living conditions. She was as dedicated to her pet as most people are to their children. I started to wonder: What if her dog had Tasha’s illnesses as well as its behavior issues? What would she do? What could she do? That’s when Bella and George formed in my head. I want to be clear: George is not that woman—not even close. He has alcoholism and many other issues that she did not have. But like her, he knows the joy and heartache that come from deep love for an imperfect creature. Unfortunately, she disappeared from the neighborhood long before I wrote the first draft of Murder Strikes a Pose. I haven’t seen her almost two years, so I’ll probably never know what she would have thought about being my muse. I hope she would have felt complimented. Rhodes Review: What was your favorite part of the book? Tracy Weber: It’s not one specific part or scene, but I loved seeing Kate grow and learn to love herself by learning to love Bella. I completely believe that love transforms us, when we are willing to allow it to. And no love is more pure than that of a human and an animal. We enter into a relationship with animals in which we know the ultimate outcome. Most animals’ lives are significantly shorter than ours. And yet, if we allow ourselves, we can find a beauty and self-sacrifice in that relationship that is at the same time deeper and more meaningful than almost any other. Kate fights that depth with every cell of her commitment-wary soul. And yet ultimately, that is what saves her. We should all be so lucky. Rhodes Review: What are your favorite authors/books? Tracy Weber: I adore light-hearted, dog-related mysteries, above all. Susan Conant, Laurien Berenson, Sheila Boneham, and Waverly Curtis are some of my favorites. I also love a good legal thriller, though I haven’t read one in awhile. A collection of crime based short stories. The Ghost of Winthrop – Prudence Winthrop has not had a moment’s peace since her Aunt Eliza died. It is said that whoever finds where her will is hidden will inherit everything. Amateur investigator Faith Fairchild is asked to help her find the will as well as discovering whether the house is haunted, or if someone else is trying to find the will before Prudence can. Death in the Dunes – Faith and her husband Tom are at a retreat when a frantic knock at the door from a woman named Carolann pulls Faith from the peaceful solitude she was enjoying. Things continue to get weird as Faith tries to determine what exactly has gone on between Carolann and her husband. The Would be Widower – A man grows tired of his wife, and continues to launch various plans to eliminate her from his life. Across the Pond – Faith and her sister Hope are involved in the wedding of a mutual friend. This mutual friend, however, is engaged to a man who was once engaged to one of her stepsisters. Faith must find out if someone is trying to kill Polly before they are successful. A Perfect Maine Day – A woman goes out on an afternoon boating trip with her husband. Later her body washes up on shore. The person who finds her body is then drawn into finding out what happened to her. Hiding Places – A woman comes across her husband’s secret hiding place, where he stores mimentos. This leads her on a search through the house for other hiding spots of his. But will she like what she finds? The Proof is Always in the Pudding – Faith is told of an old family secret that involves a pudding and a forbidden romance. Sliced – Faith is pulled into competing on a cooking contest show. Strange things begin happening though, then one of the chef’s is killed? Faith must figure out who killed him and why. The Two Marys – A woman named Mary find a baby wrapped in a blanket in her barn on Christmas Eve. Faith Fairchild is called on to help this woman cover up the identity of the child, but also to help find his mother. A few tastes from Small Plates – Recipes from some of the stories presented. I found all of these stories to be interesting. 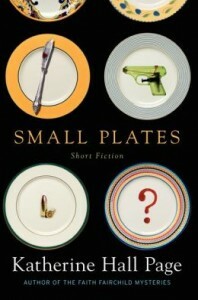 As short stories, the name small plate was fitting. Some of the more interesting I thought were The Would be Widower and Sliced, but I found all of them to be enjoyable. They are great for when you want to read a complete story, but don’t want to take the time to get involved in a long novel. They are just long enough to keep your attention, but not long enough to get too drawn out. The characters are interesting, the plots are unique, and the writing was really good. I recommend this for any mystery fans out there. I’d rate it PG due to subject matter, and some language that some might find a bit objectionable. Be sure and check it out, drop by and let us know what you thought. This novel had the unexpected experience of feeling like I was reading two stories at once. There was Joanna’s story, in which she’s trying to track down the killer of a young, mentally challenged man. The second story is that of Liza, a woman who found a fortune hidden in her deceased mother’s house, and is now on the run from people trying to kill her. Why are they after the money? Who killed Junior Dowdle? What is Liza’s connection to Bisbee, Arizona. The author did an incredible job of keeping me involved in both these stories. Each was fast paced, and complete on its own, then she managed to pull them both together and have Joanna juggling both cases. Typically with thrillers it takes me about 3 days to finish, this I was able to complete in one 24 hour period. The Junior Dowdle mystery kept you guessing until the very end and was complete with all the twists and turns you’d expect in a good mystery. The Liza story was thrilling in and of itself, and kept the pace moving, wondering who was wanting her dead, and why were they so interested in the money. I would rate it as PG-13 due to the violence, some language, and strong situations. For older teens and adults though, I don’t see that there would be an issue. Overall, a great novel, and for Jance fans, or for those wanting a good thriller, you cannot go wrong with Remains of Innocence. Grab it, read it, and drop back by and let us know what you thought. J. A. Jance is the New York Times bestselling author of the J. P. Beaumont series, the Joanna Brady series, the Ali Reynolds series, and four interrelated thrillers about the Walker family. Born in South Dakota and brought up in Bisbee, Arizona, Jance lives with her husband in Seattle and Tucson. *Disclaimer* A special thanks goes out to Megan at Harper Collins for a review copy of this book. It in no way influenced my review. You can discuss it here or join my facebook page and discuss it there. Jules Landau – Chicago Private Eye. Bernie Landau – Jules’ Father and an ex con. Jimmy Kalijero – Chicago Detective. Voss – Internal Affairs Officer. Jules Landau’s old friend Charles “Snooky” Snook has been murdered, his body left on a construction site. Bernie Landau, Jules’ father hires him to find out who murdered Snooky. Jules will find himself facing off against the local cop Jimmy Kalijero and being followed by an internal affairs officer named Voss. He’ll also find people trying to kill him to keep Snooky’s murder from being solved. I really found myself enjoying this book. It reminded me of the old private eyes like Mike Hammer and Philip Marlowe. There are plenty of twists, fist fights, and just all around fun private eye action. The plotline is well drawn out. The characters I found very likeable and 3 dimensional. Mr. Krulewitch helped fill in with some interesting background characters such as an old retired Gangster named Frownie. The story kept my attention, to the point where I actually finished the book in a little over a day. I really look forward to more entries from Mr. Krulewitch in the Jules Landau series. For a modern take on the classic private eye, he’s done a very good job, and things can only get better. Marc Krulewitch grew up in the Chicago suburbs, although his crime novels take place in the Windy City, where he was born and where his family has lived for generations. 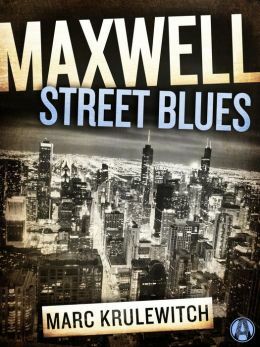 Maxwell Street Blues is the first in what he hopes to be a long and enduring detective series. His great-grandfather once shared a headline with Al Capone. An elderly woman is in the Dutch Memorial Hospital comatose, and about to undergo surgery. After she’s wheeled into the operating room, it’s discovered that she is dead. However, she was alive when in pre-surgery. When and how did someone manage to kill her between the pre-surgery room and the operating room. 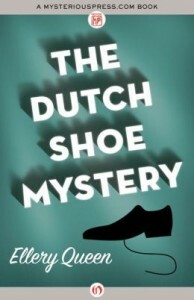 Ellery Queen and his Father are called upon to find out in The Dutch Shoe Mystery. Another interesting mental puzzle from one of the greats of this genre. With Ellery Queen, the characters as usual are a little stock and one dimensional, but the puzzles themselves are what makes the books. I tend to like fair play mysteries such as this. You are given all the clues, and if you pay attention, by the time the story is over, you’ll be able to solve the mystery yourself. So far in about 3 or 4 of his books, I’ve yet to be able to solve the mystery before Mr. Queen himself reveals the murder. For a fun weekend read, at just 239 pages, you can’t go wrong with this. A great book for those rainy afternoons. 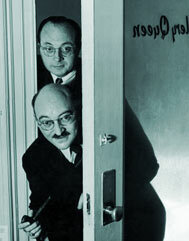 While it may not appeal to the more modern Thriller type mystery readers, for those who enjoy the pursuit of the puzzle, then you may definitely want to check out this or one of the other offerings in the Ellery Queen series. Language is at a minimum, but due to the context of the book, I’d say it’s rated PG-13. Being a product of the earlier 20th century, readers may also have some difficulty with the English used, as well as some of the more non politically correct terminology often used. But if you can ignore that, I’m certain you’d find this book enjoyable.